You’ve brushed and flossed your entire life – you take care of your teeth twice a day, every day. 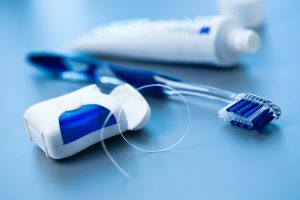 But, are you using the correct technique when completing your oral hygiene regimen? How can you even tell if you’re taking care of your smile properly? With these tips from Blue Sage Dental, your dentist in Littleton, you can brush up on your skills and keep your grin shining bright. How Often & How Long Should I Brush? 2×2 – Brush your teeth gently for two minutes, twice a day. Many patients brush harder, but for a shorter amount of time, thinking this will get the job done. Sadly, this shortcut not only leaves teeth vulnerable to tooth decay, brushing too hard can lead to gum recession. Instead, switch to an electric toothbrush that’s perfectly timed and uses the right gentle pressure. Dr. Kutis teaches patients to hold their toothbrushes at a 45° angle when making contact with their teeth and gums. Brush the outside, inside, and chewing surface of your teeth, using short, back-and-forth strokes. Be sure to brush your tongue, and to use a toothpaste that’s fortified with fluoride, since this natural mineral strengthens enamel. And, you can always watch this helpful video from the ADA to see how to brush correctly. Take your time and gently slide the floss in between teeth, moving in a c-shape to get the gums on both sides of each tooth. Don’t snap the floss between teeth – this can cause trauma to your gums. Unsure about your technique? Watch this quick flossing tutorial. If flossing is painful, try switching to a satin style dental tape, and be sure to floss at least once a day (although twice is better). What Will Happen If I Don’t Brush & Floss Correctly? Your smile is your most important feature, so take care of it like it is. Schedule your appointment with Blue Sage Dental today and learn how to brush and floss correctly with an in-office lesson!